Muslim youth held in Agra for vandalizing Hindu idols to stoke communal tension. In Ramadan time, a Muslim man named Sanu khan caught read handed while breaking Hanuman and Durga idol in a Hindu Temple in Agra. Public thrashed him. Sanu Khan- New Iconoclast in Agra. Atul Saxena | HENB | Agra | May 30, 2018:: The trails for idol vandalism inspired by Muhammad himself and his uncles and Sahabis are still in force and Ramadan may be the ideal time for them. 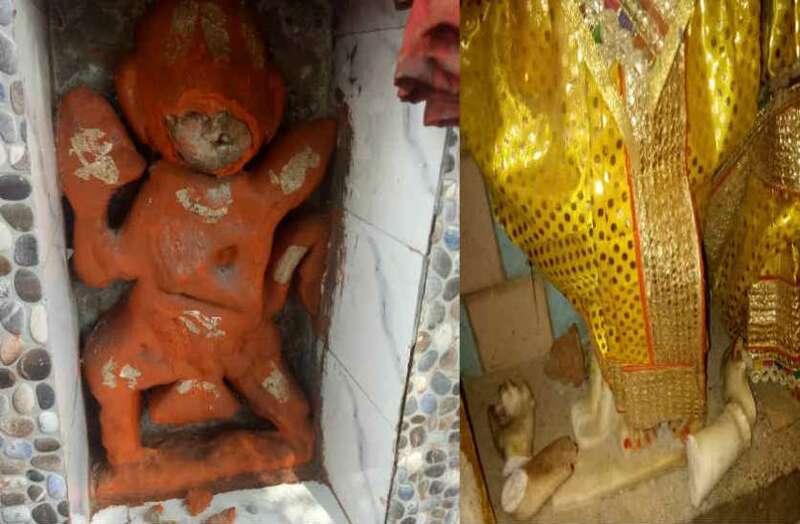 A case of idol vandalism in a Hindu temple has been reported from the Shahganj region of Agra in Uttar Pradesh, as reported by Patrika. As per the report, the accused is reported to have vandalised a Hanuman and Durga idol to try and instigate communal tension. The report also claims that such vandalism of the temple has also been reported in the past. As reported by Jansatta, on Monday morning when devotees went to the temple, which is situated in an area inhabited by a mixed population of Hindus and Muslims, they noticed the vandalized idols disgustingly. The devotees then caught hold of an individual reportedly trying to flee the temple premises, who when questioned identified himself as Sonu Khan. When he was further grilled by those present, he proceeded to change his statement multiple times, which increased their suspicion. Vandalized Hanuman and Durga idols. The Jansatta report claims that following the assault, the accused confessed that he was instructed to carry out the vandalism, in exchange of money. During the chaos, police and members of Hindu organisations reached the spot. The police later took the accused in their custody. As per an Amar Ujala report, after the news of the incident spread, a crowd started gathering which resulted in communal tension spreading through the region, though no violence was reported. The broken idols were soon replaced by new ones. Hindus do not destroy others religious places, or possessive, that is why other religions and cults thrive in Bharat. Tr. Islam is an anti-religion: it aims to destroy every creed it encounters. As such, freedom of religion should not apply to it, not least because it is a danger to such freedom wherever it spreads. We should hold a Koran bonfire every time there is such an incident. Lets consign the teachings of Islam to the flames – where they belong. 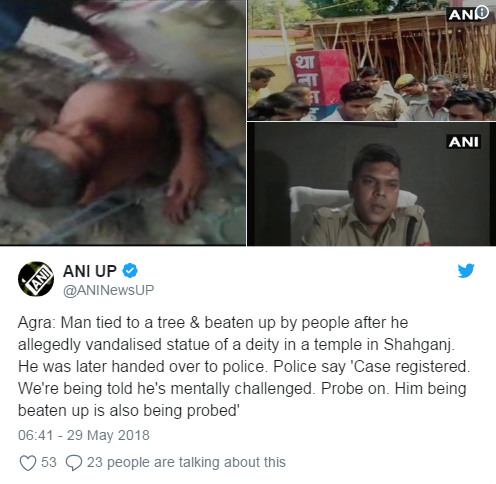 This entry was posted on May 31, 2018 by hinduexistence in Anti-Hindu, Attack on Hindu Sentiments, Attack upon Hindu Sentiment, Attack upon Hindu Temple, Attack upon Hindu Temple by Muslims, Attack upon Hindus by Muslims, Communal Situation Created by Muslims, Conspiracy against Hindus, Islamic Menace, Islamic Nuisance and tagged breaking Hanuman and Durga idol in Agra Temple, Muslim youth held in Agra for vandalizing Hindu idols, Ramadan time.